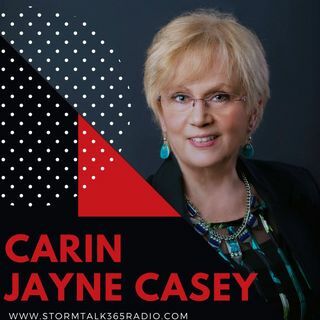 In “Turn to God with Carin,” Carin Jayne Casey shared her personal story of a life of domestic violence, and recovery. Beginning in her early forties, while Casey was depressed and lonely after her children had moved out of state, her previous relationship had failed, and she had essentially turned her back on God, she was ripe for something evil to enter her life. Casey met a charismatic and charming man who quickly swept her off her feet. He was so attentive ... See More and caring that everyone was impressed with him, and encouraged Casey in this relationship. Regardless of Casey’s efforts to go slow, the relationship galloped along from dating to living together, to buying a house and to marriage. Friends and family were no longer impressed with him. He had lost his job after the home purchase, never to work again, and he was viewed as isolating and controlling. But she was too caught in his web to break away. They married. Within weeks of their marriage, Casey’s abuser attempted to take her life, and she spent her first stint in a woman’s shelter. But after leaving the shelter a few weeks later, she was eager to put it behind her, forgive him, and attempt to rebuild her marriage. She quickly saw the error of her ways, and was trapped in a dangerously abusive environment. As abuses escalated with time and became unbearable, Casey relived the child abuse in her past in levels of PTSD and dissociation. Casey humbly fell to her knees and begged God to forgive her for turning her back on Him, for forgiveness of her sins, for her salvation through Jesus Christ. Filled with renewed faith, Casey held on as she waited patiently for answered prayer, as in Daniel 10. She did leave the home, and believed it to be over. While enjoying her new-found freedom in her apartment, her abuser captured her, bringing her back to their house of horrors. While she was broken and hopelessly at the bottom of the pit, he earnestly tried to convince her to see that she had no reason to live. Her abuser placed the deadly pills in her hand. But God! She did not do it. And, the next day God did provide her a way to escape. After running for over a mile, the police picked Casey up. She was safe. Recovery has taken years: rebuilding estranged family relationships, wrecked health, destroyed finances, and a rocky Christian Walk. As an integral part of her overcoming, and an obedient “Yes” to God’s calling, Casey has become a domestic violence advocate, sharing what she has learned. It’s a message of hope vs. hopelessness, faith vs. faithless, and a rebirth vs. devastation. As an author, she’s written “My Dear Rosa Jean,” a ‘truthful-fiction’ about a woman overcoming a life of domestic violence. She is on the Board of Directors and helps facilitate at Yeshua’s House, a local, faith-based, 18-month transitional home for women coming from domestic violence and/or financial problems. And, she has been podcasting her message on “Turn to God with Carin” through www.Stormtalk365radio.com since September 2016. Casey advertised her new podcast, "Abundant Living with Carin" that airs every Tuesday at 7:00 am EST.